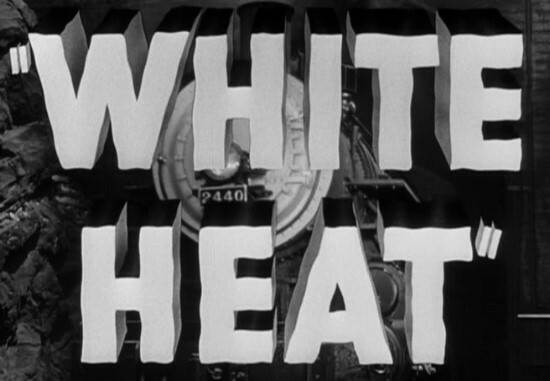 From the first frame of this movie you know you’re in for quite a ride, A big 40’s car hurtling through the desert night, filmed in such a way that you think it’s going to come flying off the screen into your lap. This movie is so well directed. 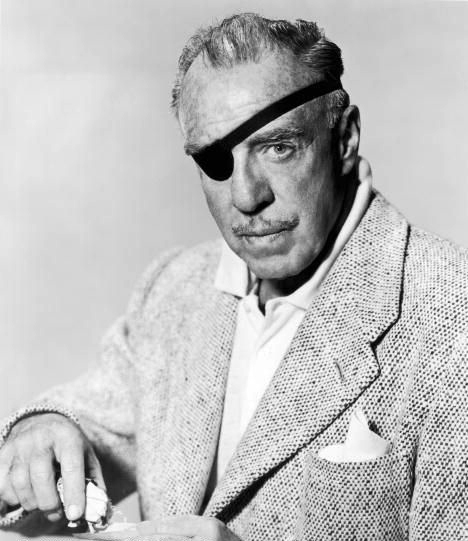 Raoul Walsh effortlessly takes us on an epic adventure, train robbery, prison, escape from prison,etc. 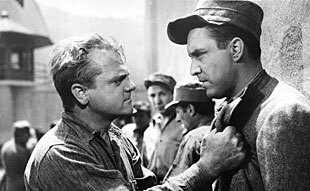 It seems like so many short scenes flowing into another, fast paced full of action, tons of details, at the prison , the machine shop and mess hall all play a role in the story. The high tech crime fighting tricks of the G men, radio co-ordinating, these scenes remind me of Fritz Lang’s M , where he shows the technology of the police opposed to the tricks of the criminals. Walsh was a master of this fast paced action storytelling. Check out Gentleman Jim starring Errol Flynn. The scenes fly by like scenery outside a train window. Walsh was a master filmmaker. 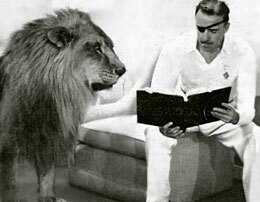 He had a lion for a house cat. I read Walsh’s autobiography, it’s very good.I found out we both went to the same prep school (Seton Hall). 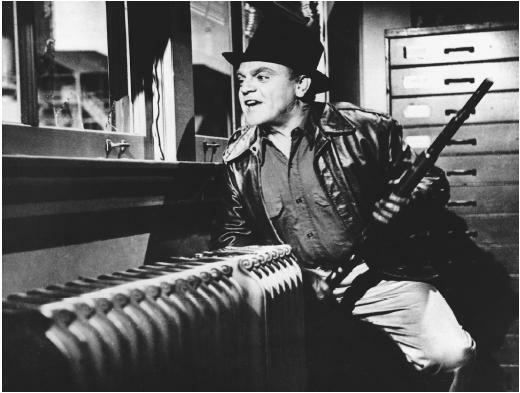 He gives a lot of credit to James Cagney for his portrayal of Cody Jarrett. 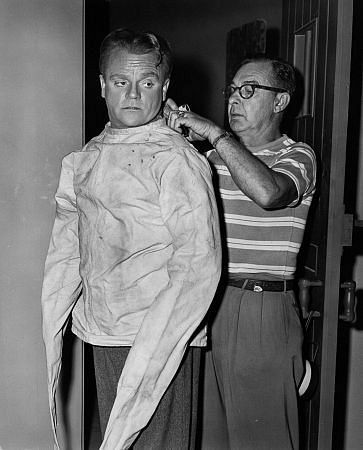 When Cagney sits on his mother’s lap and when he kicks Virginia Mayo off a chair and a lot of other great bits were all Cagney’s creation, according to Walsh. Can you shorten the sleeves a little? This is subversive filmmaking of the highest order! Walsh and Cagney show Cody Jarrett as a psycho killer, merciless to his enemies, able to coolly blast a guy trapped in the trunk of a car, while eating a chicken leg and making a joke! “I’ll give you some air!” Blam, Blam, Blam ,Blam!!! Great! The feds are seen as hard working, tireless, prosecutors of criminals but Walsh has the head fed using a long cigarette holder, an effeminate if not depraved prop. Is this a dig at J. Edgar Hoover? The cross dressing tyrant of FBI fame? Later the Fed has his arm in a sling, is he less of a man? And what about undercover rat Edmund O’Brien? Infiltrating criminal gangs by pretending to be a loyal pal, a “kid brother” to Jarrett and others. Watch the way O’Brien escapes from the surrounded payroll office during the climactic end sequence. He runs out under the cover of tear gas and literally slithers on his belly like a snake or a worm to get through a narrow gap in some pipes and into the safe arms of his fed friends. Come and get me ,copper! Then he uses his sharpshooter skills to pump several bullets into Jarrett, who’s laughing his head off. “What’s holding him up!” O’Brien asks as he fires another round into his erstwhile friend. But Jarrett is buoyed up by his love for his mother, he’s finally fulfilled her lifelong prophecy, he’s made it to the top. “Top O’ The World, Ma! !” He yells triumphantly and he sees her watching him proudly, her eyes shining with admiration and love for a son only she can love, the flames of Cody’s immanent annihilation reflecting from those eyes that represent the whole world and everything in it to him. First, I never realized you’d gone to prep school. Second — what, no mention of Steve Cochran? 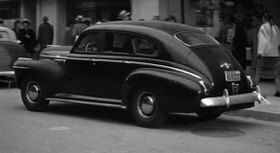 He’s fantastic in this movie, especially that one bit where he gives a secret sign to Virginia Mayo as their cars are about to drive in separate directions, and also in that bit where he breaks into laughter just before Cagney kills him. Do you know the scene I’m referring to? Sorry no mention of Steve Cochran, I need to scan that lobby card you have. 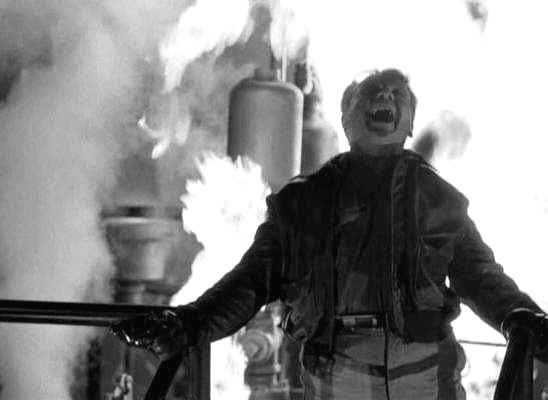 And I agree he is great but I was in a hurry to post this, I think I’ll write more about White Heat, Cagney ushered in the gangster film with Public Enemy and here he kills it off in an Allegorically Atomic Blaze of Glory. There are a lot of points still to be covered on this film. Justine Thanks for your kind words once again!